Reflecting on the fight against online violence is fascinating in many ways: philosophically, politically, socially, legally, technically, ethically. Analysing opinions, the general feeling is that violence in the present day is unacceptable. Overexposure to hatred is abhorrent, and by trivializing insults, it has passed the point of no return. Hearing reports of powerlessness in the face of hatred, listing cases of ineffectiveness of the courts, the inadequacy of their responses and justice in this area disappoint both civilians and law and order professionals. Who hasn’t already been confronted, if only as a witness, with school harassment, which today is multiplied by what happens on social networks? Who hasn’t feared for others, or been afraid that a child or fragile person, or sometimes a relative, is the object of bullying or hazing? Who hasn’t been confided in by a young person, someone close to family or friends, who has been abused or excluded from class and/or social networks? What classroom has not faced the question “what happens when harassment, via social networks, comes into our school? In our classroom?” Who, on the internet, has not come across – repeatedly – content that horrified them? Who, in a professional context, has not received or been copied in on e-mails containing gratuitous violence which has lasting effects in relationships and psychological experiences? Out of all these thoughts came the idea of a tool-label-shield, in blue and white, to confront hatred and encourage respect in exchanges between Internet users. This initiative was developed and proposed by two young teenagers, Nathan and Adrien Coen. The Respect Zone logo is made of two hands of different colours that, in spite of their difference, form a heart with their fingers. This sign at its core is proposed as a digital self-defence sign, in the same colors and format as the other buttons of social networks (also, all or almost all of them, blue and white colors, in a “flat” format, and with an octagonal and rounded outline). There was an urgent need to develop this idea and put forward proposals for a safer, more respectful and, in the end, more interactive and therefore more democratic Internet once the anxiety created by the encounter with hatred on the corner of the keyboard had been removed. If the defended cause did not resonate in the digital and personal experience of most people who have encountered this initiative in their path, the idea of “respect together” would not have received the assent and immediate support of ministries, UN agencies, humanitarian or anti-discrimination associations, professional associations, civil servants, hundreds of global and local businesses, advertising and digital agencies, students, teachers, religious leaders, artists, bloggers, or even our 10 thousand followers (a good fifth of whom are North African and from the Middle East) on social media and the millions of pages and advertisements viewed on the subject. The cause of the fight against cyberviolence and its impact on the individual and the community resonates deeply, regardless of age, occupation, or their social, cultural or economic background. Fighting cyberviolence and harassment is one of the few causes that everybody can get behind. 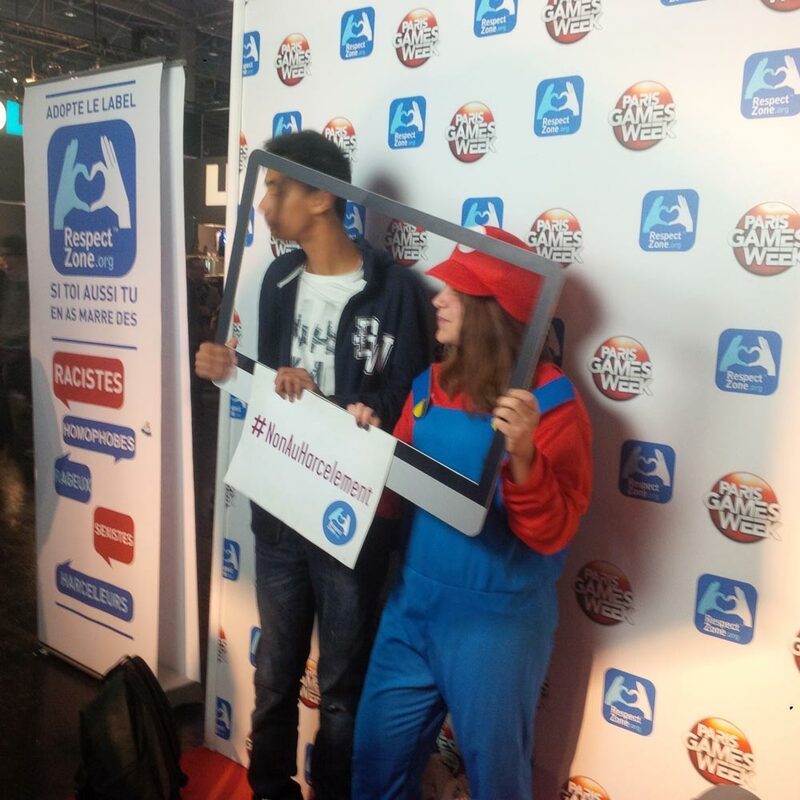 The digital Respect Zone label was launched at the center of the digital universe during the most popular event for video game fans: the Paris Games Week exhibition at the Porte de Versailles. Respect Zone was supported from the outset by online influencers: famous Youtubers, such as Cyprien, Squizzie, Vortex, or Kyan Khojandi, author of the series Bref, and the video game industry, brought together under the umbrella of the national professional association Sell. The history of the Internet shows that everything took off too fast when it was launched. Careful thinking was shunned and there has been no overall strategy; it is the empirical principle of a network-based construction. After the Internet bubble of the early 2000s, social networks were born out of the imagination of young students from prestigious American campuses. Building on the success of social networks, there was the pleasure of meeting “friends” and communities and making connections. That was the promise of these start-ups. Internet users flocked to social media and there are now several billion users on only half a dozen networks. The Internet contributed to the Arab Spring and other popular, spontaneous, and democratic uprisings. We even thought for a while that social networks would invite us to sign up for free. Then Internet users realized that their personal data were valuable, that a new market was opening up trading this data, that registrations on these networks created a new form of consensual alienation in certain respects, and that the term “friend” was at the same time overused and no longer meant much. The term “contact” would be more appropriate today than “friend”. Internet users tend to keep their batches of digital friends (or connections) for two reasons: to avoid becoming de-socialized, and to keep an eye on the behaviours of connected members of this “virtual” community. Indeed, it is difficult to say to someone else “you’re not my friend anymore,” and to block them without offending the other or arousing resentment. Fighting cyber violence is particularly humbling and reminds us of the myth of Sisyphus, as the battle is so unequal and the slope of hate is steep, but when we think of victims and sufferings online, campaigning for online respect becomes obvious. Our relationship with the Internet sometimes resembles that of someone living with an abusive spouse. The victim knows that if they come back to it too much, they’ll damage themselves. We know that being accepted or refused in a group is a decision that we may regret one day because, on the Internet, the data hardly disappears, and the mass of subscriptions and registrations and acceptances of online contracts, or of affiliation to sites and networks (the “terms & conditions” and legal conditions of belonging to a “community”), means that once registered, we quickly forget which networks we belong to. We know that our most personal data will sometimes be hacked, or misappropriated. Fortunately, the law of personal data protects Internet users, and some companies know how to offer better conditions of protection than the applicable law. Why do Internet users like to ignore all this? Why do we offer up our privacy, codes and passwords? To give ourselves the feeling of existing by exhibiting ourselves? This is a debate for the psychiatrist community. This self-blind observation raises questions. Online, Internhate takes on a falsely virtual character. It speaks to the imaginary and thus becomes a fantasized or nightmare reality. Social networks and the Internet are not evil incarnate. Let’s not think backwards about the conspiracy. Machines contain only what their designers and users put into them, as pointed out by Jean-Gabriel Ganascia in his work on the myth of singularity. Social networks are interactive, multimedia tools: they organize, organize, stimulate, motivate, can help regulate, orientate, raise awareness, but platforms, software and codes do not constitute the content. The Internet is our mirror machine, and we are free to define its instructions for use and decide on its settings. It is precisely against this renunciation, against this lethargy to fight against online monstrosities that we want to find the springs of indignation and resistance. Facing inertia, nurturing counter-discourse, identifying areas of respect, these are the challenges that our time brings, challenges that we want to question and test. This plea is a call for peaceful self-defence, to say STOP to violence, to resist, to refuse injustice, to reject insensitivity, and to protect the youngest of us.